The Eurasian nomads were a large group of nomadic peoples from the Eurasian Steppe, who often appear in history as invaders of Europe, the Middle East and China. The generic title encompasses the varied ethnic groups who have at times inhabited the steppes of Central Asia, Mongolia, and what is now Russia. They domesticated the horse around 3500 BC, vastly increasing the possibilities of nomadic life, and subsequently their economy and culture emphasised horse breeding, horse riding and nomadic pastoralism; this usually involved trading with settled peoples around the steppe edges. They developed the chariot, wagon, cavalry and horse archery and introduced innovations such as the bridle, bit and stirrup, and the very rapid rate at which innovations crossed the steppelands spread these widely, to be copied by settled peoples bordering the steppes. Scythia was a loose state or federation covering most of the steppe that originated as early as 8th century BC, composed mainly of people speaking Iranian languages, and usually regarded as the first of the nomad empires. The Roman army hired Sarmatians as elite cavalrymen. Europe was exposed to several waves of invasions by horse people, including the Cimmerians in the 8th century BCE, various peoples during the Migration period, the Magyars in the Early Middle Ages, the Mongols and Seljuks in the High Middle Ages, the Kalmuks and the Kyrgyz and later the Kazakhs up to modern times. The earliest example of an invasion by a horse people may have been by the Proto-Indo-Europeans themselves, following the domestication of the horse in the 4th millennium BCE (see Kurgan hypothesis). Cimmerian is the first invasion of equestrian steppe nomads that is known from historical sources. Their military strength was always based on cavalry, usually marked by prowess as mounted archers. Kurgan is a general term for steppe burial mounds, which sometimes contained very elaborate burials. Historically, areas to the north of China included Manchuria, Mongolia and Xinjiang were inhabited by nomadic tribes. Early periods in Chinese history involved conflict with the nomadic peoples to the west of the Wei valley. Texts from the Zhou dynasty (c.1050-256 BC) compare the Rong, Di and Qin dynasty to wolves, describing them as cruel and greedy. Iron and bronze were supplied from China. An early theory proposed by Owen Lattimore suggesting that the nomadic tribes could have been self-sufficient was criticized by later scholars, who questioned whether their raids may have been motivated by necessity rather than greed. Subsequent studies noted that nomadic demand for grain, cereals, textiles and ironware exceeded China's demand for Steppe goods. Anatoly Khazanov identified this imbalance in production as the cause of instability in the Steppe nomadic cultures. Later scholars argued that peace along China's northern border largely depended on whether the nomads could obtain the essential grains and textiles they needed through peaceful means such as trade or intermarriage. Several tribes organized to form the Xiongnu, a tribal confederation that gave the nomadic tribes the upper hand in their dealings with the settled agricultural Chinese people. During the Tang dynasty, Turks would cross the Yellow River when it was frozen to raid China. Contemporary Tang sources noted the superiority of Turkic horses. Emperor Taizong wrote that the horses were "exceptionally superior to ordinary [horses]". The Xiajiasi (Kyrgyz) were a tributary tribe who controlled an area abundant in resources like gold, tin and iron. The Turks used the iron tribute paid by the Kyrgyz to make weapons, armor and saddle parts. Turks were nomadic hunters and would sometimes conceal military activities under the pretense of hunting. Their raids into China were organized by a khagan and success in these campaigns had a significant influence on a tribal leaders prestige. In the 6th c. the Göktürk Khaganate consolidated their dominance over the northern steppe region through a series of military victories against the Shiwei, Khitan, Rouran, Tuyuhun, Karakhoja, and Yada. By the end of the 6th century, following the Göktürk civil war, the short-lived empire had split into the Eastern and Western Turkic Khaganates. The concept of "horse people" was of some importance in 19th century scholarship, in connection with the rediscovery of Germanic pagan culture by Romanticism (see Viking revival), which idealised the Goths in particular as a heroic horse-people. J. R. R. Tolkien's Rohirrim may be seen as an idealised Germanic people influenced by these romantic notions. Tolkien's Wainriders of eastern Rhûn recall ancient steppe peoples like the Scythians. Similarly, George R. R. Martin's nomadic Dothraki people are heavily influenced by the lifestyles and cultures of historical horse people. Nomadism persists in the steppelands, though it has generally been disapproved of by modern regimes, who have often discouraged it with varying degrees of coersion. Chronologically, there have been several "waves" of invasions of either Europe, the Near East, India and/or China from the steppe. ^ "What We Theorize – When and Where Domestication Occurred". International Museum of the Horse. Retrieved 2015-01-27. ^ "Horsey-aeology, Binary Black Holes, Tracking Red Tides, Fish Re-evolution, Walk Like a Man, Fact or Fiction". Quirks and Quarks Podcast with Bob Macdonald. CBC Radio. 2009-03-07. Retrieved 2010-09-18. ^ Annamoradnejad, Rahimberdi; Lotfi, Sedigheh (2010). "Demographic changes of nomadic communities in Iran (1956–2008)". Asian Population Studies. 6 (3): 335–345. doi:10.1080/17441730.2010.512764. ^ a b Di Cosmo, Nicola. "Ancient Inner Asian Nomads: Their Economic Basis and Its Significance in Chinese History." The Journal of Asian Studies 53, no. 4 (1994): 1092-126. ^ Susan E. Alcock (9 August 2001). Empires: Perspectives from Archaeology and past. Cambridge University Press. pp. 19–. ISBN 978-0-521-77020-0. Amitai, Reuven; Biran, Michal (editors). Mongols, Turks, and others: Eurasian nomads and the sedentary world (Brill's Inner Asian Library, 11). Leiden: Brill, 2005 (ISBN 90-04-14096-4). Drews, Robert. Early riders: The beginnings of mounted warfare in Asia and Europe. N.Y.: Routledge, 2004 (ISBN 0-415-32624-9). Golden, Peter B. Nomads and their neighbours in the Russian Steppe: Turks, Khazars and Qipchaqs (Variorum Collected Studies). Aldershot: Ashgate, 2003 (ISBN 0-86078-885-7). Hildinger, Erik. Warriors of the steppe: A military history of Central Asia, 500 B.C. to A.D. 1700. New York: Sarpedon Publishers, 1997 (hardcover, ISBN 1-885119-43-7); Cambridge, MA: Da Capo Press, 2001(paperback, ISBN 0-306-81065-4). Kradin, Nikolay. 2004. Nomadic Empires in Evolutionary Perspective. In Alternatives of Social Evolution. Ed. by N.N. Kradin, A.V. Korotayev, Dmitri Bondarenko, V. de Munck, and P.K. Wason (p. 274–288). Vladivostok: Far Eastern Branch of the Russian Academy of Sciences; reprinted in: The Early State, its Alternatives and Analogues. Ed. by Leonid Grinin et al. (р. 501–524). Volgograd: Uchitel'. Kradin, Nikolay N. 2002. Nomadism, Evolution, and World-Systems: Pastoral Societies in Theories of Historical Development. Journal of World-System Research 8: 368–388. *Kradin, Nikolay. 2003. Nomadic Empires: Origins, Rise, Decline. In Nomadic Pathways in Social Evolution. Ed. by N.N. Kradin, Dmitri Bondarenko, and T. Barfield (p. 73–87). Moscow: Center for Civilizational Studies, Russian Academy of Sciences. *Kradin, Nikolay. 2006. Cultural Complexity of Pastoral Nomads. World Cultures 15: 171–189. Kradin, Nikolay. Nomads of Inner Asia in Transition. Moscow: URSS, 2014 (ISBN 978-5-396-00632-4). Littauer, Mary A.; Crouwel, Joost H.; Raulwing, Peter (Editor). Selected writings on chariots and other early vehicles, riding and harness (Culture and history of the ancient Near East, 6). Leiden: Brill, 2002 (ISBN 90-04-11799-7). Shippey, Thomas "Tom" A. Goths and Huns: The rediscovery of Northern culture in the nineteenth century, in The Medieval legacy: A symposium. Odense: University Press of Southern Denmark, 1981 (ISBN 87-7492-393-5), pp. 51–69. Wikimedia Commons has media related to Eurasian nomads. A nomad is a member of a community of people without fixed habitation who regularly move to and from the same areas, including nomadic hunter-gatherers, pastoral nomads, and tinker or trader nomads. As of 1995, there were an estimated 30–40 million nomads in the world. The Rouran Khaganate, Ruanruan, Ruru, or Tantan was the name of a state of uncertain origin ,, although it is commonly believed that its people were descended from the Xianbei. 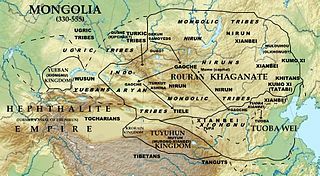 The Rouran are noted for being the first people to use the title of "khan" or "khagan". The Rouran Khaganate lasted from the late 4th century until the middle 6th century when they were defeated by a Göktürk rebellion which subsequently led to the rise of the Turks in world history. The Rouran may have fled west after that and became the Pannonian Avars, however this is a contested theory among historians. The Göktürks chased after these "Avars" into the Byzantine Empire and referred to them as "Varconites" who were escaped slaves of the Türks. However they also claimed that these were not "true Avars", who remained in the east as subjects of the Türks, while the ones in the west were only "pseudo-Avars". The history of Central Asia concerns the history of the various peoples that have inhabited Central Asia. The lifestyle of such people has been determined primarily by the area's climate and geography. The aridity of the region makes agriculture difficult and distance from the sea cut it off from much trade. Thus, few major cities developed in the region. Nomadic horse peoples of the steppe dominated the area for millennia. Scythian art is art, primarily decorative objects, such as jewellery, produced by the nomadic tribes in the area known to the ancient Greeks as Scythia, which was centred on the Pontic-Caspian steppe and ranged from modern Kazakhstan to the Baltic coast of modern Poland and to Georgia. The identities of the nomadic peoples of the steppes is often uncertain, and the term "Scythian" should often be taken loosely; the art of nomads much further east than the core Scythian territory exhibits close similarities as well as differences, and terms such as the "Scytho-Siberian world" are often used. Other Eurasian nomad peoples recognised by ancient writers, notably Herodotus, include the Massagetae, Sarmatians, and Saka, the last a name from Persian sources, while ancient Chinese sources speak of the Xiongnu or Hsiung-nu. Modern archaeologists recognise, among others, the Pazyryk, Tagar, and Aldy-Bel cultures, with the furthest east of all, the later Ordos culture a little west of Beijing. The art of these peoples is collectively known as steppes art. Turco-Mongol or the Turko-Mongol tradition was an ethnocultural synthesis that arose in Asia during the 14th century, among the ruling elites of Mongol Empire's successor states. These elites adopted Islam while retaining Mongol political and legal institutions. The Pontic–Caspian steppe, or Pontic steppe is the vast steppeland stretching from the northern shores of the Black Sea as far east as the Caspian Sea, from Moldova and eastern Ukraine across the North Caucasus Federal District, Southern Federal District and the Volga Federal District of Russia to western Kazakhstan, forming part of the larger Eurasian steppe, adjacent to the Kazakh steppe to the east. It is a part of the Palearctic temperate grasslands, savannas, and shrublands ecoregion of the temperate grasslands, savannas, and shrublands biome. Turkic migration refers to the expansion of the Turkic tribes and Turkic languages into Central Asia, Eastern Europe and West Asia, mainly between the 6th and 11th centuries. The region of origin of the Turkic peoples is suggested to be somewhere in Siberia, Mongolia or northwestern Manchuria. The Ordos culture was a culture occupying a region centered on the Ordos Loop during the Bronze and early Iron Age from the 6th to 2nd centuries BCE. The Ordos culture is known for significant finds of Scythian art and is thought to represent the easternmost extension of Indo-European Eurasian nomads, such as the Saka. Under the Qin and Han dynasties, from the 6th to 2nd centuries BCE, the area came under at least nominal control of contemporaneous Chinese states. The Eurasian Steppe, also called the Great Steppe or the steppes, is the vast steppe ecoregion of Eurasia in the temperate grasslands, savannas, and shrublands biome. It stretches from Bulgaria, Romania and Moldova through Ukraine, Russia, Kazakhstan, Xinjiang, and Mongolia to Manchuria, with one major exclave, the Pannonian steppe or Puszta, located mostly in Hungary and partially in Serbia and Croatia. Yueban, also written Üeban, Urpen literally: "Weak Xiongnu") was the name used by Chinese historians for remnants of the Xiongnu in Zhetysu, now part of modern-day Kazakhstan. In Chinese literature they commonly called Yueban. The Yuebans gained their own visibility after disintegration of the Eastern Xiongnu state, because unlike the main body of the Northern Xiongnu, who escaped from the Chinese sphere of knowledge, the Yueban tribes remained closer to China. Nikolay Nikolaevich Kradin is a Russian anthropologist and archaeologist. Since 1985 he has been a Research Fellow of the Institute of History, Archaeology and Ethnology, Far East Branch of the Russian Academy of Sciences in Vladivostok. He was Head and Professor of the Department of Social Anthropology in the Far-Eastern National Technical University, and also Head and Professor of the Department of World History, Archaeology and Anthropology in the Far-Eastern Federal University. Corresponding Member of the Russian Academy of Sciences (2011). The Khitan people were a nomadic people from Northeast Asia who, from the 4th century, inhabited an area corresponding to parts of modern Mongolia, Northeast China and the Russian Far East. They spoke the Khitan language, which appears to be related to the Mongolic languages. As the Liao dynasty, they dominated a vast area north of and including parts of China. After the fall of the Liao dynasty in 1125 following the Jurchen invasion, many Khitans followed Yelü Dashi's group westward to establish the Qara Khitai, or Western Liao dynasty, in Central Asia, which lasted several decades before falling to the Mongol Empire in 1218. The conquest of the Western Turks, known as the Western Tujue in Chinese sources, was a military campaign in 657 led by the Tang Dynasty general Su Dingfang against the Western Turkic Khaganate ruled by Ashina Helu. The Chinese war against the Western Turks began in 640 with the annexation of the Tarim Basin oasis state Gaochang, an ally of the Western Turks. Several of the oasis states had once been vassals of the Tang Dynasty, but switched their allegiance to the Western Turks when they grew suspicious of the military ambitions of the Tang. Tang expansion into Central Asia continued with the conquest of Karasahr in 644 and Kucha in 648. Su Dingfang commanded the main army dispatched against the Western Turks, while the Turkic generals Ashina Mishe and Ashina Buzhen led the side divisions. The Tang troops were reinforced by cavalry supplied by the Uyghurs, a tribe that had been allied with the Tang since their support for the Uyghur revolt against the Xueyantuo. Su Dingfang's army defeated Helu at the battle of Irtysh River. The military of the Tang Dynasty was staffed with a large population of Turkic soldiers, referred to as Tujue in Chinese sources. Tang elites in northern China were familiar with Turkic culture, a factor that contributed to the Tang acceptance of Turkic recruits. The Tang emperor Taizong adopted the title of "Heavenly Kaghan" and promoted a cosmopolitan empire. Taizong regularly recruited and promoted military officers of Turkic ancestry, whose steppe experience contributed to the western and northern expansion of the Tang empire. The Turkic general Ashina She'er participated in the Tang capture of the Karakhoja, Karasahr, and Kucha kingdoms in Xinjiang. The half-Turkic general An Lushan started a revolt that led to the decline of Tang Dynasty. This article summarizes the History of the western steppe, which is the western third of the Eurasian steppe, that is, the grasslands of Ukraine and southern Russia. It is intended as a summary and an index to the more-detailed linked articles. It is a companion to History of the central steppe and History of the eastern steppe. All dates are approximate since there are few exact starting and ending dates. This summary article does not list the uncertainties, which are many. For these, see the linked articles. This is a short History of the central steppe, an area roughly equivalent to modern Kazakhstan. Because the history is complex it is mainly an outline and index to the more detailed articles given in the links. It is a companion to History of the western steppe and History of the eastern steppe and is parallel to the History of Kazakhstan and the History of central Asia.